Throughout his career, Mohamed Bourouissa has anchored his projects in collaboration with friends and strangers. His Barnes Foundation exhibition, titled “Urban Riders” and constituting his first solo show in the United States, comprised eighty-five works related to the time he spent with Philadelphia’s Fletcher Street Urban Riding Club. In interviews, the Paris-based artist has cited Martha Camarillo’s 2006 photographs of this community of African American men as the catalyst for his own visit and his desire to explore the mythology of the American cowboy. 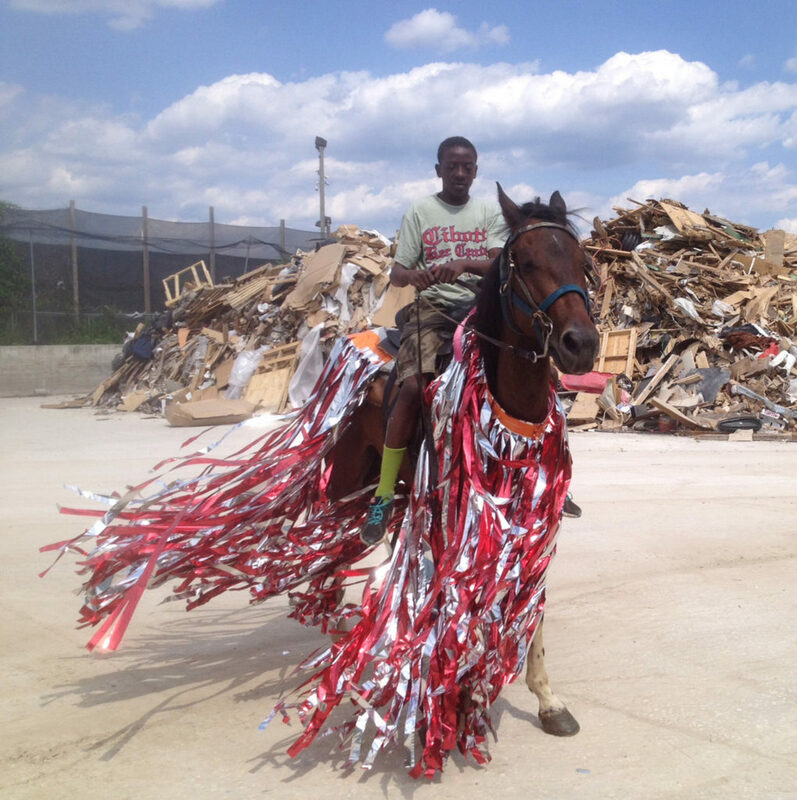 Over the course of eight months in 2013, Bourouissa lived near, drew, photographed, and filmed the riders and organized a public riding pageant, for which the riders collaborated with Philadelphia artists to create costumes for the horses. In the years since, he has continued to make work based on the experience. The first gallery contained much of the preparatory material for the pageant, including copies of the event flyer; Bourouissa’s drawings of riding equipment, the neighborhood, and the riders; and a number of horse costumes hung on pegs or shown on wooden mannequins. Through particular installation choices—such as plastering one of the walls with the flyer and displaying an array of the drawings on freestanding panels of untreated wood, from which wafted the smell of sawdust—the first room had the feel of an active work space, an impression that highlighted the open-ended, collaborative nature of the project. In the second gallery, the focus pivoted away from cooperative enterprise to the figure of the black urban cowboy. At the center, Bourouissa installed a viewing area for his two-channel film Horse Day (2015). The left channel shows footage of the club members riding around the city, and the right homes in on the public event and the field in which it took place. As most of the scenes on the left are shot at medium or close range, the riders and horses appear large-scale, pressed against the frame. In one breathtaking traveling shot, the camera, pointed out a car’s passenger seat window, follows a lone horseman along a city street for a moment before the horse, breaking into a full gallop, runs into a stretch of lawn, out of the camera’s tight frame. In contrast, the playback of the riding event features several sweeping views of the urban arena; one of the most memorable sequences in the film is an aerial shot for which the camera panned down as riders galloped across, and the grassy expanse gradually overtakes our view. The third and final gallery was devoted to a series, made by Bourouissa after he left Philadelphia, of large, wall-mounted assemblages of riding gear and scrapped car parts, the latter printed with photographs of the riders. It is a clever layering: cars and horses, with their speed and power, are central to a certain type of masculine mythology. Reminding us that these mythologies are double-edged, works like The Ride (2017), with its crush of ragged metal sheets roughly cut from different vehicles, fragment the images of the men and their surroundings as much as they hold them together. There are also moments of tenderness in the depictions. A rendering of a young man juts out from Keason (2017), the delicate curve of his back appearing vulnerable amid the clash of materials and images. As one of the last works encountered in the show, Keason left viewers with a sense of the ways in which toughness and gentleness can be inextricably entwined.